No surprises here: House of Cards third season will premiere on Netflix in Australia, rather than Foxtel, which was the home for Seasons 1 & 2. It’s the news we all knew was coming, but had never been confirmed by Netflix. It was a done deal when the show was missing from Foxtel’s 2015 Upfronts. Now the next question is: when? 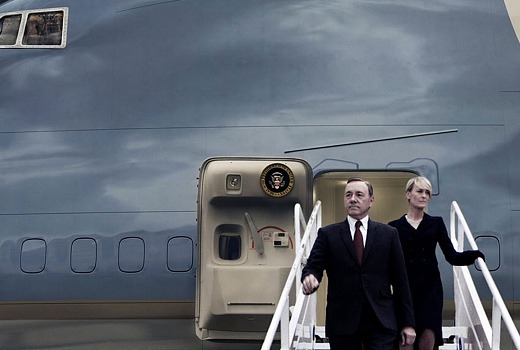 House of Cards premieres in the US on February 27th. Netflix has not confirmed its Australian launch date but there is speculation it will be March 31st. A price is also not confirmed. Launch titles will include Bloodline, Marco Polo, BoJack Horseman, All Hail King Julien, plus upcoming titles Daredevil, Sense8, Grace and Frankie, Virunga, Mission Blue, Uganda Be Kidding Me from Chelsea Handler, and Jim Jeffries’ Bare. Orange is the New Black remains with Foxtel. Chief content officer, Ted Sarandos, says Netflix is also keen for Australian commissions. “[Australian production] is attractive; you have a great production infrastructure, a great creative history, particularly in comedy, of making great shows,” he told Fairfax. So now you want me to buy a laptop too? Depending on how far away your PC is from your TV – you could also connect by an audio and a video cable (blue connection) if your pc has an outlet and your tv has the relevant inputs. Admittedly not that convenient. If you have an ipad – the lightning cable connection to an hdmi cable is easy. But then again it all depends on what you have. I used to connect an old laptap with Wi-Fi but it didn’t have quite enough grunt – the ipad works really well though – of course you need to have a wifi modem to your main pc. Great, so looking forwards to the time when you will need to subscribe to 65 million different services just to watch all your fave shows, foxtel, stan, presto,netfilx etc etc…. They(the service providers) think customers have an unlimited money pot so we can subscribe to foxtel, as well as stan,presto, netfix and any other company like amazon that might start up in aust. I thnk you will see some people only subscribe to one carriage, and if a particular show is on another, well either watch it by other means, or wait for the dvd/bluray to come out. I have foxtel, and am planing on buying transparent on bluray later this year, not giving stan a cent of my money(even with the free month offer they have or had). There will either be industry consolidation or more of an a-la-carte approach before too long. But now is a time of deep pockets and fighting to be one of the survivors until the next big shake-up. Very different crowd of people here! I think you have to start paying for Fetch with Optus after the first 12 months. I’m so disappointed about this. I too find it difficult to watch a show on my compute when I’ve got a giant 75 inch TV in my living room, plus having Foxtel, I refuse to pay for another streaming service (which is especially shattering now Better Call Saul is out there)… and to add to that, I’m in the increasing minority it seems, that I just can’t binge watch a TV show… I like my weekly appointment with a show. I bassically am getting Fetch for nothing as I was paying around $105 for Unlimited broadband and phone calls with Optus I called them and they offered me the same deal but included Fetch Tv for a cost of $90 per month. I barely use it as we mainly use Netflix and Foxtel but it’s nice to have at no extra cost. Pay $50 and get a Chromecast. This is bad news! I really loved the first two seasons, watched on Foxtel. I’m afraid I’ve found Stan, and probably ditto for Netflix, too inconvenient to use. I don’t much like watching drama on my computer, and getting stuff from Stan (and probably Netflix) to a television is beyond me. Perhaps I just can’t be bothered trying…. Now if it was Game of Thrones or The Walking Dead, it would be a different story! Everyone wanted competition to Foxtel, this is what the future will be, multiple platforms with their own exclusives meaning you will need to own a bunch of them and end up paying what we used to for Foxtel anyway. As it is I have Fox, Netflix, Hulu and Stan. ie, I only have Stan for Better Call Saul. Given the many platforms and exclusives that will inevitably come, it will still remain difficult to get people to not source their content elsewhere. Curious – if you have Netflix why did you sign up to Stan for BCS? You can switch to the UK Netflix for BCS. Do you think series 3 will eventually be on Foxtel? So I’ve got to pay more to see this show on another platform, it’s on thing the have it on iTunes where it’s pay-per-view but Netflix is another cost many will just not be willing to pay for, especially if they have Foxtel. Doesn’t help they are still to announce a launch date for the service and they complain people are illegally downloading their show?